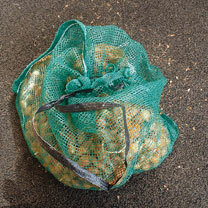 Five dark green woven nets with a braided drawstring for storing onions and other vegetables. Each sack will hold up to 12.5 kg. Reusable. Pack of 5 nets.